Stabilisation of a failed masonry wall using HeliBeam in-situ masonry beams to span between new piled foundations. 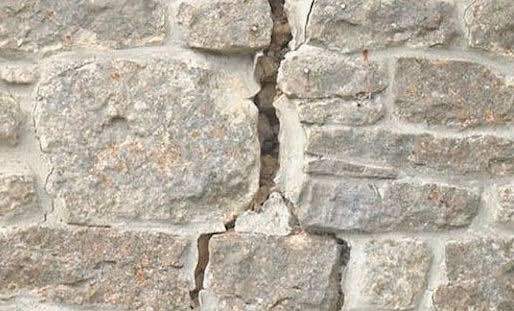 Working in conjunction with a Specialist Piling Sub-Contractor, TRAC Structural Ltd designed and installed a combined HeliBeam and Piling solution to stabilise the corner of the building where substantial settlement was evident from the extensive tapered cracks in the masonry structure. 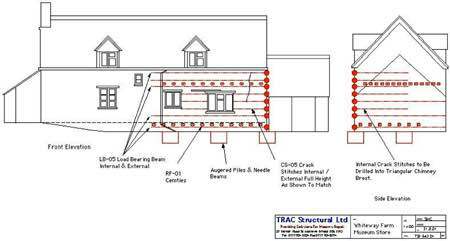 This solution avoided the need for continuous underpinning. The repair is detailed on the installation drawing and utilised the ability of the HeliBeam system to span up to 3 meters between the piles. Without this facility, continuous underpinning would have been required, with the additional cost that this would have entailed.